community » Discussions » Category » Photography & Art » Discussion » Turtle Time! 3) Snapping Turtle … I estimate this one weighed about 40 pounds … likely a female that left the water to lay eggs. One of four different species of turtles I photographed on the road into the Reserve … even before entering the reserve itself! Last week I did some photography at a wild life reserve at the New Jersey seashore; on the road leading into the preserve, was able to photograph three different species of turtles. … it'll take a while. Funny, when they are at the edge of our lake they can turn and "jump" into the water in a fraction of a second. When they are caught out on the walking paths, they expect to be picked up and moved to the lakeside grass. What does the voice of a turtle sound like? I have heard some hiss before. Odd looking fellow, with that white mouth. Be careful, there are members here who will crucify you for a racist statement. Haaha. I have been called many things over the years. In China, people keep them as pets. My brother-in-law's son has kept one for years. They have cultural symbolism here. 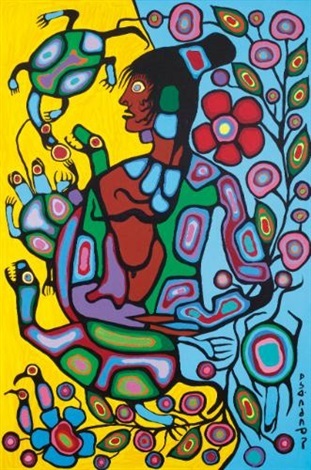 The turtle appears in many of Norval Morrisseau's paintings. 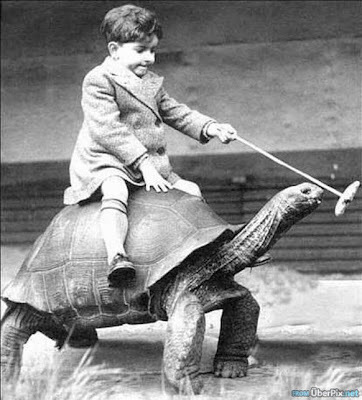 For example, this one is called "Shaman and Turtle". A turtle cannot be cute. That's a great turtle photo, Mac. One of my children collects turtle figurines and Christmas tree ornaments. If you don't mind my asking, what's the name of the wild life reserve? My wife and I are planning an east coast road trip in the fall, and if it's not too far from our planned route and if we have time, we could include it. I'm looking forward to more of your turtle pics! On the longest of long shots, if you let me know a few days in advance when you might be there, I would try to drive down from Philly and meet you there and give you a "guided" tour, although, it's not at all difficult to drive the 8 mile loop. Fall is the best time because the greenhead flies that will bite you into submission, are less prevalent and sometimes not around. More turtle pics later today. The Edwin B. Forsythe National Wildlife Refuge protects more than 47,000 acres of southern New Jersey coastal habitats. Thanks for the Forsythe Refuge links, Mac! It looks like a place we'd really enjoy visiting. Thanks also for adding your box turtle photo. Before you go, a good idea to maximize the experience, is to get a field guide, and/or go on-line, and familiarize yourself with shorebirds, wading birds, gulls, terns, ducks, sandpipers and swallows … especially if going in the fall when migrating birds may be present for the only time during the year. A second TURTLE image is posted. They like the asphalt, don't they? We used to move them to the road side whenever we came across them. Of course, thinking they will just go right back to where we found them. Do you ever come across snapping turtles? We used to come across them often while fishing. My recollection is, they are permanently in bad moods. Living dinosaurs. We have those. Their claws are unreal. Long necks too. Can take a finger real quick. I will be posting a picture of a Snapping Turtle soon. Alright, I will be on the look out for it. Their claws are unreal. Long necks too. Can take a finger real quick. You have to be very careful when grabbing them. Last year I was scuba diving in the pond at the local ski hill to recover lost skis. Zero visibility. I found a number of skis plus the giant snapping turtle, and I didn't realize he wasn't a ski until he poked my glove with his claws, nipped the back side of my glove and swam away.....about that time my brain was catching up and I realized "that's not a ski". I think he was the one who was scared but I was glad I had neoprene gloves on. The folks who've seen him said that his shell is at least 18" long which is pretty big for this area. The nearby farm I used to live at had a snapper which would sun himself in the middle of the one-lane bridge, so once or twice a day I'd have to get out of the car and grab him by the tail while running backwards really fast to get him off the road. Wow. You could have easily lost some fingers and more. They're not aggressive towards people when they're in the water, at least not if they realize that you're people and not prey. So once I realized what it was I was more surprised that it had bothered to nip my glove at all. Regarding the one we kept removing from the driveway, I learned much later that you're not supposed to grab them by the tail or drag them but just to grab them by the shell just above the tail and lift. just to grab them by the shell just above the tail and lift. Exactly and you have to be firm and quick about it. Everyone, please come out of your shells and see the turtle pics. Interesting images on the shell of the Box Turtle. One almost looks like the sacred Thunderbird. I never paid attention to the design until you pointed it own. Then I was looking at all of them. A hieroglyphics expert should look at them - maybe there's an ancient message there. Two more species to come. Remember with mammals there is a chance to reason with them. With reptiles? Not so much. That bad girl can take a finger, toe or part of your hand or foot off in a hot minute. Yep, keep a good distance. Ruined a good turtle stew too. Your great photos of turtles are very timely. We just had a female lay eggs in our backyard. Did a little research and found out that she was a painted turtle. Now we are waiting 2 months to see the babies and help them get into the stream that runs through are back yard. I will post a picture of a painted turtle later today; it was the fourth or the 4 species I photographed during the Reserve outing. Painted Turtle … picture 4) is posted. This is why you don't tease a snapping turtle. And finally, a second view of Box Turtle … Picture 5). A couple of more beauties...Well done Mac.